The military wing of Hamas announced Monday evening that it had completed its preparations towards a possible all-out conflict with Israel should the IDF launch a ground offensive inside Gaza. A spokesman for the organization warns that "the fighters of the al-Qassam brigades will not have mercy on your cowardly soldiers. Your destroyed tanks will become the eternal testimony of your failure and of your running away from the Strip." The statement was made at a time when the IDF has evidence showing that dozens of advanced anti-tank missiles have been smuggled into Gaza. According to the Hamas spokesman Israeli reports regarding the advanced weaponry that Hamas allegedly smuggled into Gaza are "in preparation for an attack, an excuse for the planned invasion of Gaza and for the planned crimes (it plans to commit)." The spokesman, Abu Ubaida, said that his organization has the weapons it needs to withstand the Israeli arsenal: "We have the tools and ammunition to deal with the Zionist enemy and it is our right to have all the weapons means to defend our people in light of the enemy's intention to hurt civilians and innocents. We have a right to any arms we can get." He added that Hamas is ready for the challenge that Israel poses, should it decide to open an all-out front. "We are ready willing and able," said Abu Ubaida, "we have completed our preparations to teach the Zionist enemy a lesson that he, with Allah's help, will never forget. This attack will become a nightmare that will haunt the Zionists everywhere. Your failure in Gaza will repeat itself, but this time the lesson will be much harder. Our fighters are already lying in wait to ambush the enemy. If the enemy thinks that invading Gaza and confronting Hamas is a simple thing, then he is living in an illusion." Despite the IDF's ongoing activity, a Qassam rocket landed near a residential building in Sderot Monday evening. Two people were wounded from shrapnel and six more were treated for shock. Another rocket landed in an open area near Kibbutz Nir-Am in the western Negev earlier Monday, no injuries or damage were reported. The sappers who handled the remains of the rockets discovered that the Islamic Jihad had written 'Al-Quds 3' on them in Hebrew. The Islamic Jihad's spokesman in Gaza, Abu Abdullah, explained the writing in a conversation with the Reuters news agency, saying that the organization decided to write the name in Hebrew to make sure that the attack was credited properly: "It is intended to discern our rockets from the rockets of other organizations," he said. Israeli authorities nearly always refer to the makeshift rockets fired from Gaza as Qassams, the name of those made by Hamas, the ruling party and Fatah's chief rival. Hamas was the first to fire rockets into Israel and so its Qassam moniker has become the generic term. As a result, other militant groups feel they are not getting enough credit among the Palestinian populace for the attacks they launch against Israel . Abu Ubaida said that Hamas had no plans to label their rockets in Hebrew. He called it a boon for Hamas that the "factions are running an honest and positive competition in rocket firing". "When everybody competes to strike the enemy, this is a victory to Hamas's agenda of Jihad (holy war) and resistance," Abu Ubaida said. 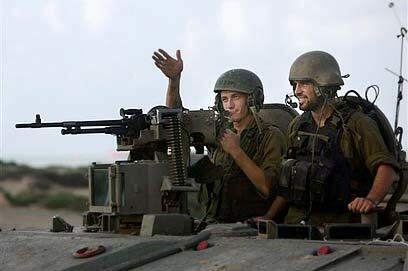 See all talkbacks "Hamas: Israel's tanks will be destroyed"